The EVO finishing press can help you achieve a variety of textures using varnishes, SPOT UV and iFoil. With this unique press we can create detailed patterns, realistic textures and other finishes that add visual and tactile appeal. The EVO can apply varnishes and SPOT UV up to 200 microns thick, so you can choose the profile that best suits your project. And you can use a combination of matte and glossy varnishes in your design for textural interest and have them applied at different thicknesses for even more contrast. 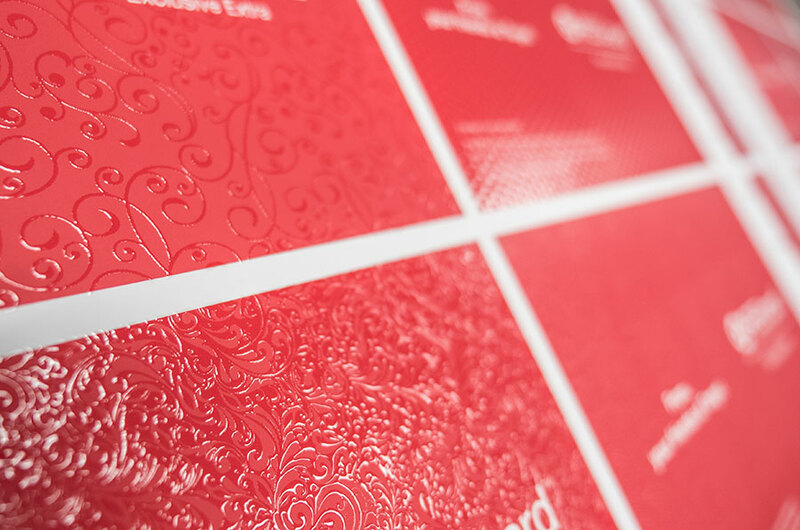 Patterns created with raised UV coating create tactile interest and invite engagement to draw your customer in. By incorporating texture with the EVO, you can create precise patterns that elevate your design, to help you create a memorable business card or an impressive quarterly report. Whether your design is monochrome or multicolored, you can use print embellishments to add patterns and textures that draw attention to specific elements, like a logo or tagline. With the JETvarnish 3D Evolution, embellishment options can be combined in unique combinations to create whatever effect you’re looking for. 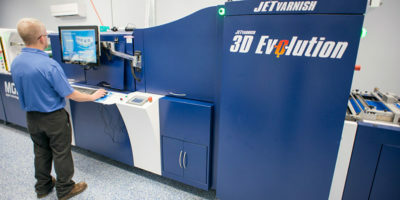 Varnish, SPOT UV, iFoil, metallic sheen, die cuts and embossing — the JETvarnish 3D Evolution can handle it all at 3000 ISO B2 sheets per hour. 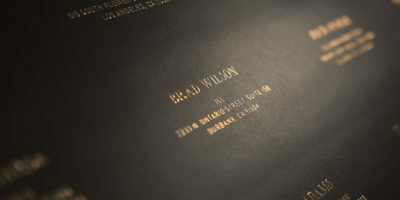 At Embossing Plus, we pride ourselves on our lightning-fast turnaround backed by decades of industry experience. 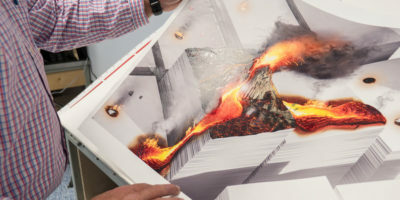 Our staff of industry veterans are available to provide a specialized consultation to help you choose the print embellishment options that fit your project and your budget.